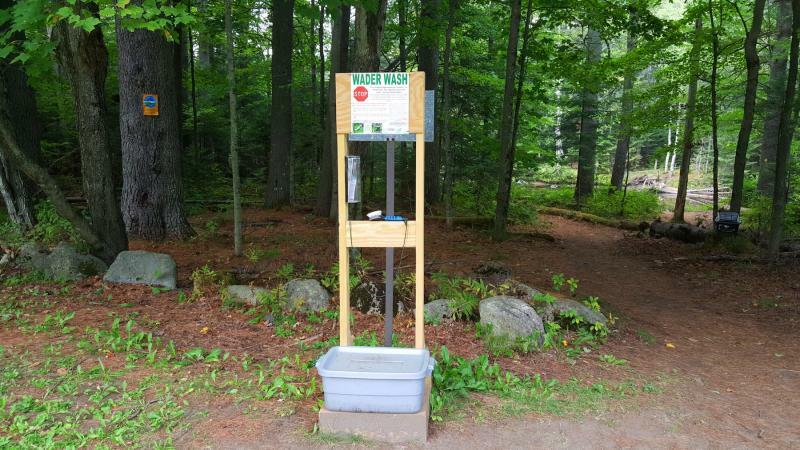 This year, the Ausable River Association (AsRA) received funding from the Lake Champlain Basin Program to build seven new Wader Wash Stations. These stations are more compact and lightweight and replaced larger, older models in several key locations (see map at left). Stations are placed along the West Branch at popular fishing access points. The goal is to have anglers use the stations to kill any aquatic invasive species that may be attached to their waders before entering the river. Anglers soak their waders and boots for just 60 seconds and then let them dry before fishing to avoid transporting harmful invasive species into the Ausable's pristine waters. Specific invasive species threatening the river, such as Didymo (rock snot) and New Zealand mud snail, are killed by the 10% salt solution found at each station. AsRA's river steward maintains these stations throughout the season, changing the solution frequently and keeping the surrounding areas clean. The river steward encourages the use of these stations when discussing the dangers of aquatic invasive species with anglers and other river users. Aquatic invasive species have the potential to smother fish habitat or outcompete native animals, threatening the West Branch's world class fishery. The stations prevent invasive hitchhikers from migrating into the Ausable.